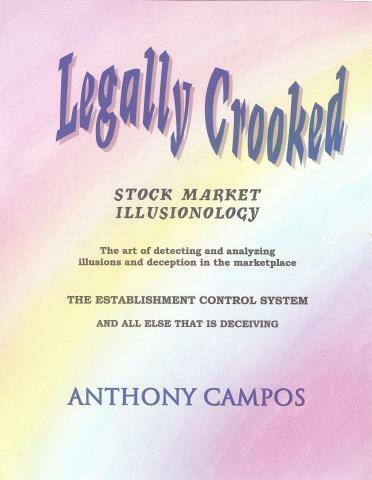 YOU MUST UNDERSTAND THAT THE MARKET IS LEGALLY CROOKED AND LEGALLY MANIPULATED........Those who control the market need only to control the stocks that lead in each sector. Warning: market manipulation may be hazardous to your wealth. Faith is truth but sight may not. and the mesmerizing colors exist only in sight. disappears into nothingness after a moment in time. You have seen soap operas and you have seen wrestling matches. The stock market is a little of both. Exchange and brokerage insiders write the script.......the media makes the presentation and does the promo work. Then, investors respond with emotional glee or sob. This book is totally revised from my 1990 edition. Everything that I stated about the NYSE specialist system was proven correct. Does the problem of control still persist? Yes, it does. However, the people and entities that have taken over control from the specialists are now even more dangerous, because these forces have more capital and more network resources than what was true of the NYSE specialist system. However, consider that the specialist firms have all been taken over by the big banks and big brokerage houses. While the principles of market control remain the same, it becomes important for investors to realize how these new big players are employing their strategy against public investors. The financial vampire system continues. It is all legal under the law, but it is also very ethically crooked. Every investor should know how the game is being played by these Wall Street vampires which includes the big banks, brokerage houses and the financial news media.